Are You Ready For The Human--Cell Phone Mind Meld? Sensors are everywhere around us from smartphone touchscreens to elevator buttons to thermostats. These sensor devices, which receive and respond to a signal, are a linchpin of the so-called "Internet of Things." As they become smaller, cheaper and require less power they are being deployed in more places that we encounter every day - whether we are aware of it or not. 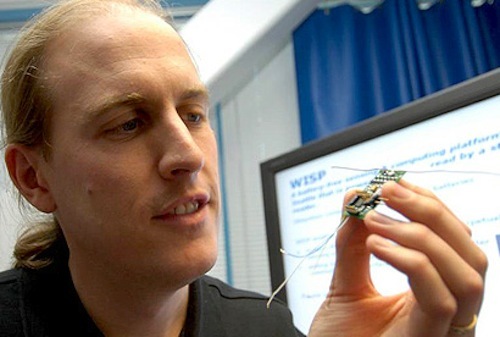 Joshua Smith is a researcher on the cutting edge of sensor technology. Smith holds nearly 20 patents, including a capacitive sensor he developed as part of his MIT doctoral thesis that detects passenger position for airbags - if the passenger's head is too close to the side airbag, the sensor will disable it. The technology has been deployed in Hondas since 2000. Today, Smith leads the Sensor Systems Laboratory and research group at the University of Washington, where he is an associate professor of Computer Science and Electrical Engineering. The former principal investigator at Intel Research Seattle, where he led robotics projects, is now focused on inventing sensor systems, devising new ways to power them and developing algorithms for using them. Recently, Smith discussed the state of sensors, current and future projects, and the concerns that arise as sensors become more commonplace. Sensors are all around us, but that doesn't mean people are aware of them. Where do we encounter sensors in everyday life? Sensors are kind of creeping up on us. They're growing in importance and finding themselves in places we don't think about. At a high level, there are sort of these two worlds. There's the world of information and computation and even mind and thought, and then there's the physical world of matter and energy and stuff like that. Sensors are the place where those two things touch. That's one of the exciting things about sensors. In terms of your daily life I think sensors are getting more and more common. Your phone has a ton of sensors now. The touchscreen itself is an interesting kind of sensor. I remember reading Walt Mossberg's review of the iPhone and he was writing about the addition of a compass in the phone and he said, "That's ridiculous. I don't need a compass!" But he didn't realize that the point of the compass was not so you know which way is north when using it in compass mode. It's a whole lot of other things, so when you combine a compass with an accelerometer, when you do navigation it can show maps to you in the right orientation. Another area that you don't see in everyday life but I think is exciting is the possibility that sensors will help create better robots. If you think of a sensor as a window through which a digital system, or computer, can look at the physical world, it gets more exciting if the computer can, not only look at the world through the sensors, but can actually start to physically change the world. Sensors can help make robots possible. What are the latest developments in sensor technology? Sensors are getting smaller, lower in power, lower in cost. Another big thing is that computing is getting more capable and lower in power. We have been building on is the fact that as Moore's Law continues, the energy efficiency of computing has been improving. That means for the same amount of energy we can do more instructions per microjoule. What that means is it's starting to be possible to power sensors wirelessly and at greater and greater range and greater distance as time goes on. That's exciting. The type of things we've been working on is harvesting energy from RF signals from sources like TV towers and cell phone towers. We want to collect energy in order to run sensors perpetually so you can do a lot of different things. One of the projects we're working on is powering a new type of low-power chemical sensor. This would be for outside a chemical plant. The sensors would monitor if chemicals are being released in the air, checking the air quality and relaying the information. Another is searching for a parking spot. The sensor could be mounted to every parking spot and from your phone or another device you can find out where the nearest open parking spot is. What about sensors inside the human body? We have a center here called the Center for Sensorimotor Neural Engineering. We're trying to make brain implants that are wirelessly powered and these can be used by people who have diseases that cause seizures. Today, temporary implants are used to measure when the seizure is happening, but they have to be removed after a few days. If we can wirelessly power those, then perhaps you could have something that looks out for problems one at a time and maybe stop the seizure as it is happening, and you can use the same technology potentially for brain computer interface. Another slightly crazy thing that we're working on is trying to create brain implants that are powered and read by near-field communication. What that means is your cell phone could talk to the implant electronics in your brain and power it. Who knows what the possibilities are, but if there's going to be some type of implant in your brain then why not have the cell phone be the thing that powers and reads it? You think you like your cell phone now? Imagine when it can read your thoughts. The possibility that we can actually implant some of these things is mind-blowing because we can wirelessly power the sensors, and keep them in the body for a long period of time. I think that's really exciting. What's the next big development your see for sensor technology? One big trend I see is the possibility of solving the power and connectivity issue. A lot of people worked on sensor networks in the 1990s, and I think one of the big remaining problems that's preventing the large-scale adoption of that stuff is the power problem. If we can do wireless power and connectivity to sensors I think it makes wide-scale deployment of sensors feasible. It was just too hard and expensive to power them.